Who's got $5 million to spend on 30 seconds of Super Bowl advertising time? Kia, Mercedes-Benz, Hyundai, Audi and Toyota did. But some brands managed to get a taste of the spectacle without dumping money into airtime and big-budget productions. Hip-hop legend Big Boi pulled up for his halftime performance at Mercedes-Benz Stadium in -- what else? -- a throwback Caddy. Ford, too, qualified for vintage treatment. Ram, conspicuously absent from the network broadcast, worked the social networks instead. Here's a look at some brands that got in on the Super Bowl hype without running TV ads during the game. Big Boi, one half of Atlanta's OutKast rap group, couldn't let the Super Bowl come into his hometown without performing during the halftime show. The rapper, decked out in a fur coat that made PETA cringe, pulled up to the stage in what appeared to be a 1970 Cadillac DeVille convertible, its gaping grille filling the TV screen. 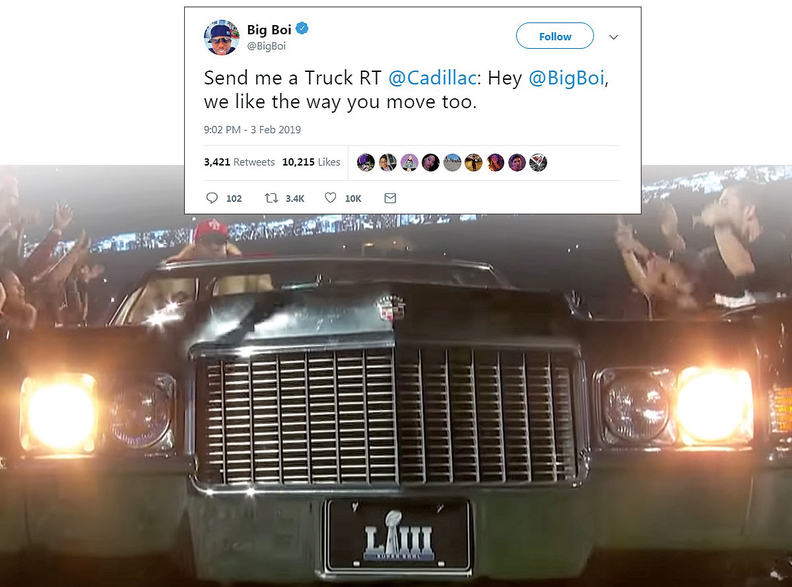 The stunt sparked a fun conversation between Big Boi and Cadillac's social media crew on Twitter, with the Cadillac team alluding to an OutKast hit and complimenting the rapper on "the way you move." Big Boi's response: "Send me a Truck." 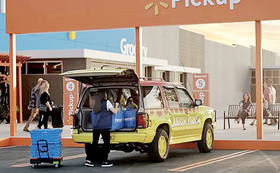 Renewing the lease on a generation-old product placement, a Walmart spot featured the classic Ford Explorer tour vehicle from the first Jurassic Park film, now packed with groceries — and a few dinosaur hatchlings. It shared screen time with an array of famous movie vehicles, including the Batmobile, the Wagon Queen Family Truckster from National Lampoon's Vacation, the DeLorean from the Back to the Future franchise and the Ghostbusters Cadillac known as Ecto-1. Another Ford Explorer popped up on Super Bowl Sunday, this time a later model. 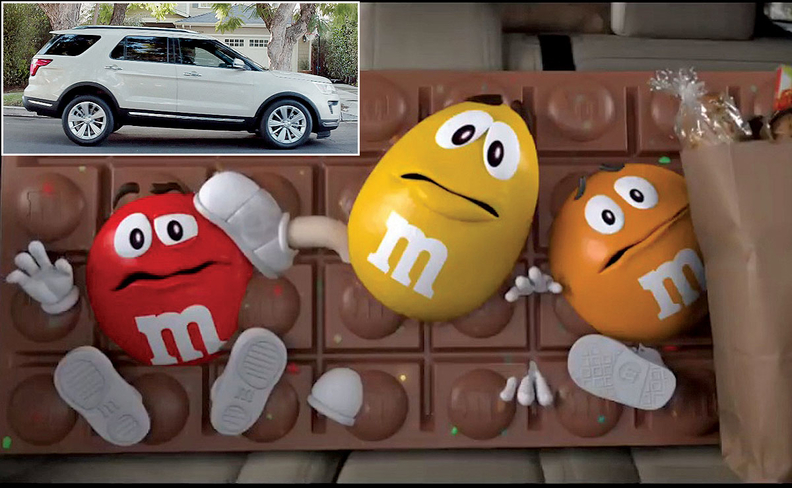 With Christina Applegate at the wheel, the lovable M&M's mascots bickered in the back seat of Ford's unmistakable family hauler, featured in the opening frame in a rear shot that clearly showed the blue oval on the tailgate, and later in a full profile view. 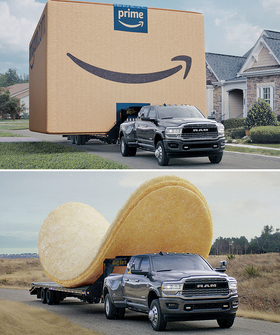 Fiat Chrysler Automobiles abstained from Super Bowl TV ads for the first time since 2009, running a few plays from its digital playbook instead, in collaboration with brands such as Amazon, M&M's and Pringles. After each of those brands aired its TV ad, the Ram Twitter account mentioned them in lighthearted video responses that showed the 2019 Ram Heavy Duty hauling their products. Leading up to game day, FCA launched a "Big Game Blitz" of seven online commercials, including a visual interpretation of the national anthem and one featuring a herd of rams stampeding from Los Angeles toward Atlanta. They encounter a Ram HD pickup, packed with fans dressed as rams heading to the game — a concept that apparently hinged on the Saints losing the NFC title game.